A Google search for “church fundraiser” is enough to make your head spin — there are literally hundreds of options to choose from. To help readers decide, Church Executive consulted with a few “in-the-trenches” fundraising experts. Some fundraising ideas are “tried-and-true” for a reason: They work. And doggone it, people like them. According to Matt Fass, owner of Mission Viejo, CA-based ABC Fundraising, cookie dough falls into this category, as do two other popular options: flower bulbs and candles. “First, cookies, flowers and candles are always welcome additions to the home,” Fass says. “Almost all people enjoy them, and they brighten up peoples’ lives. They’re uplifting — which is in line with the values of a church.” Second, he contends familiar products are easier sells. Last but not least, he points out that these ideas don’t require a startup cost. Another unique idea is to sell custom “church-opoly” board games — not just the games itself, but sponsorships of the dozens of “properties” around the board and of the paper money. Jay Abramson, owner of Pride Distributors, Inc., has been making these custom games for more than 30 years. He’s helped more than 1,500 organizations — many of them nonprofit — raise millions of dollars. As Abramson points out, part of the fundraiser’s success is its lack of upfront cost. “You could sell all the ad spaces [properties] in one day, or it could take two years,” he says. “But, the neat thing is, the game only gets produced once the ad spaces are sold.” Then, he works with clients to determine how many games to produce. Church clients can get pretty creative when selling the spaces/properties — hosting a “property auction,” or even selling the spaces to church families. “What’s great about these [games] is that people actually talk while playing them,” he points out. Often, those conversations revolve around the property sponsors. Abramson suggests selling the 36 ad spaces/properties for about $280 each and individual board games for $25. At that rate, a nearly $13,000 profit is possible by selling just 500 games. 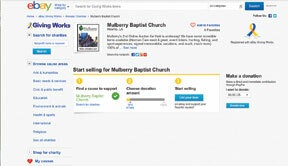 In 2011 and 2012, to raise funds for their church’s mission of building a duplex in Haiti, deacon Hank Babin and pastor Steve Graves of Mulberry Baptist Church in Houma, LA, took an old-school fundraising idea — the church auction — to a new-school format: eBay. The process wasn’t hitch-free, but the monetary (and resulting ministry) payoffs were inspiring. To date, the church has raised more than $60,000. Naturally, the option of hosting an online auction emerged. Graves and Babin quickly discovered eBay Giving Works — an established, credible and national marketplace. That year, the church made $25,000 in support of the Haiti mission selling donated football tickets, weekend getaways and other offerings. Last year, donors were encouraged to “stay home for Haiti.” A staff member gave up his baseball season tickets. More sports tickets followed — to football games, and even the Masters golf tournament. Hunting, fishing and sport expeditions, and signed memorabilia, were offered up. The church raised about $37,000. To promote the auction, Babin and Graves capitalized on Facebook and email, word-of-mouth marketing and generous donations of ad space, including a local billboard. eBay also helped out with promotion, providing banner ads, videos and articles during and after the auction. Finally, Graves urges churches to remember that an auction doesn’t really end when it closes. “We follow up with donors, buyers and other supporters to help them know they were not only part of an auction, but the mission work in Haiti,” he explains. These reminders take the forms of trip reports, personal notes, pictures of children in Haiti saying ”thank you,” and invitations to celebrate the mission work at the church. For more than 40 years, the women of Velda Rose United Methodist Church (VRUMC) in Mesa, AZ, have held three-day rummage sales twice a year. While the concept isn’t new, what is unique is their success rate: They’ve generated as much as $49,000 in a single weekend! And since their first sale in 1965 (which profited $523), the women have raised in excess of $1.1 million in support of a wide range of charities. “People are good to us. God is good to us,” says Joan Most, who heads up the sales. Now, the women of VRUMC are taking their rummage to another level — by going indoors. Last year, the church added a 20,000-square-foot, single-story sales and storage building to its property: the Velda Rose UMC Missions Warehouse. It accepts donations Monday through Friday, year-round. To pay off the mortgage, the building is being “sold” for $40 per square foot to church members. Donors are recognized on a plaque on a “Wall of Honor.” Most says this idea (which she credits to her husband) has been the most profitable, so far. To raise additional funds, she and her team also host an English tea; sell cookbooks, fruit cakes and cookie bears; and regularly offer “Unique Boutique” wares for sale, including handmade creations by a church sewing circle. Additionally, Most says, a bond on the property has been forgiven. 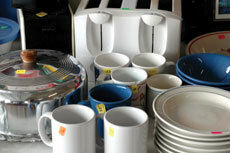 The church’s last three-day sale, held in February 2013, netted more than $45,000. In our country, most churches, religious organizations and even schools sell raffle tickets as a way to raise runds. Cash and other valuable items are at stake for the lucky winners.